Signs of Spring are really coming thick and fast on the Patch. 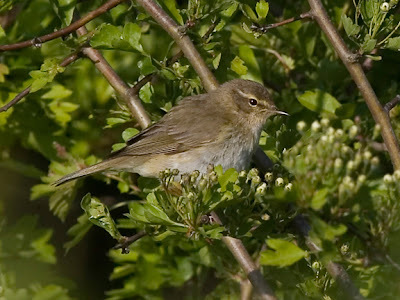 It's been so busy that I have neglected the blog a bit, but I have a couple of stories to tell starting with the curious incident of the loose-bowelled Chiffchaff. I am out early again, loving the lengthening days that allow birding before and after work. Back down to the Lapwing fields between the old campsite and Dungeon footpath. The Lapwings are still at it, maximum count is 38. I just can't get bored of the tumbling display flight, the bizarre calls and the undertail covert flashing. The Brown Hares are still busy too, boxing being observed on 2 occasions. Just past Dungeon Bridge I hear my first Chiffchaff of 2011 calling. Awesome! I love these little warblers, a favourite sign of Spring. It is pretty distant so it'll take a while to locate, but I'm in no rush, I know I'll connect with it, and I do but not in the way I imagined. As I drift back towards the Visitor Centre I pause under the large thick-trunked willow that stands between the horseride and footpath/cycle track. I scan across the First Field counting Lapwings. A Brown Hare lollops past, stops, looks about, continues lolloping, disappears. Pheasant struts out. Chiffchaff calls. It's close so I fancy I can clap eyes on the little rascal. The sun is out on a glorious spring day. I'm in the half shade of the willow, the shadow of it's bare branches looks like a filled in dot-to-dot puzzle on the ground. A shadow flits along a branch. I look up and zero in on the Chiffchaff. I follow it with the binoculars as it explores the folds of the bark gleaning insects from the trees wrinkles. It is meticulous with it's feeding, I suppose you'd be hungry too if you'd just arrived from Northern Africa. It is right overheadnow still picking at the bark. It is a massive willow and has plenty to probe. As I watch I am thinking about it's huge migration with all the risks that this includes and decide this bird is well worthy of my respect. 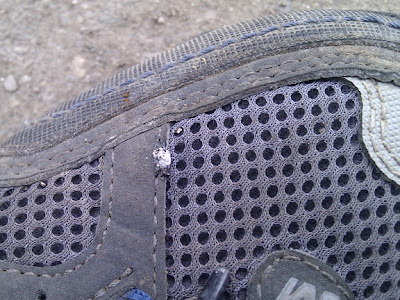 However, it clearly has no respect for someone poking their nose into it's busy schedule. A miniscule flash catches my eye as it falls by my face. It is followed by a light slappy plop sound. It takes a couple of seconds to work out what has hapenned. It's pooped on me. On my shoe. Only a tiny little poo, but a poo none the less. Cheeky rascal! Reflecting on this a little later I am actually happy that I got this unexpected package from Africa, a fleeting and daft connection with a cracking little long distant migrant. I've been keeping an eye on the sky for a passing Osprey, another top migrant. However I wish to keep my connection with this bird purely visual!